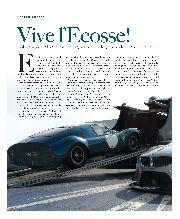 Ecurie Ecosse, the Scottish team with the French name, is on the road back to Le Mans. 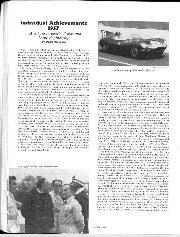 Fifty-five years after it won the Vingt-Quatre Heures for the second time running, the team is back and, wherever else it might venture between now and then, there is no doubting its ultimate destination. Those other achievements since McCaig took over the team founded by David Murray include winning the 1986 C2 Championship and proving that privateers could beat the manufacturers in the BTCC with David Leslie and Ray Mallock-run Cavaliers in ’93. 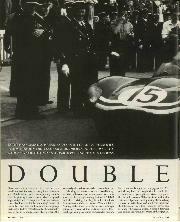 Even so, if you think of Ecurie Ecosse, you think of those privately entered D-types, the one that beat all comers including the Jaguar works team to victory in 1956, and those that came irst and second the following year. 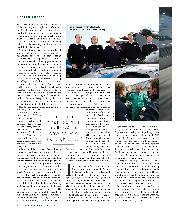 More than half a century later Ecurie Ecosse is back at the start of a long and winding road that it is hoped will take it to Le Mans. The renewed team irst dipped its toes back into competitive waters at the Spa 24 Hours last year, with McCaig’s son Alasdair being joined by Joe Twyman, Andrew Smith and Oliver Bryant, driving an Aston Martin DBRS9. 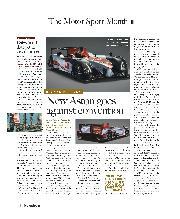 “The aim was just to inish the race,” recalls Twyman, “which is what we managed.” The car ran reliably and well, but its five-year-old design showed very clearly how quickly GT3 cars have developed in the interim. It qualified 10 seconds off the pace of the pole-sitter, coming home a respectable 20th overall (out of 62 starters) and ninth in the ProAm class. To me, GT3 racing currently represents all that is good about sports car racing. Indeed it reminds me of the BPR championship of the mid-1990s where showroom-based supercars developed by the works but run by private teams breathed new life into GT racing. Then, of course, the money turned up with works teams that had no interest in the spirit of the sport but only the letter of the law, and within a remarkably short period of time it was all ruined. But, for now, if you want to see a massive array of different machines from manufacturers including Porsche, Ferrari, BMW, Mercedes, McLaren, Nissan, Aston Martin, Ginetta and even Chevron in action, all of these will be contesting the GT3 category of the British GT Championship this year. 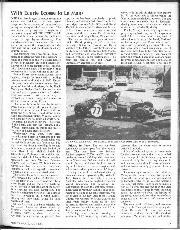 McCaig makes no secret of the fact that, ideally, he’d like Ecurie Ecosse to be running a British car but, as he puts it, “the Aston sounded good, looked good and had a great name, but ultimately the BMW is a lot quicker and a lot cheaper.” When the name of the game is to win races to attract sponsors to raise money to get the team back to Le Mans, there seems little doubt which car represents the better value for money. So what are we dealing with here? Any suggestion that it’s just a stripped out road car with some fancy bodywork can be dispelled right away. In fact the list of what it shares with the road car (its basic structure) is short compared with what it does not (everything else). So while the street Z4 has a four- or six-cylinder engine, a manual or automatic gearbox and part-steel, part-aluminium bodywork, the racer has a V8 motor, a six-speed sequential paddle-shift transmission and a carbon-fibre body. And as for the aero package, you can see by the size of the rear wing, the complex rear diffuser and the deep front splitter with its little winglets that BMW means serious business with this car. With its long bonnet, longer wheelbase and rearward seating position, there is something decidedly Gotham City about this low-slung bullet. It looks extremely fast, but more than that it looks like fantastic fun. Mercifully it’s a very easy car to climb aboard, and once behind the wheel there’s nothing here you wouldn’t expect to see in a state-of-the-art GT racer. The steering wheel is a mass of buttons and switches allowing you to control the traction and stability control, engine map, pitlane speed limiter and so on, beyond which is an LCD dash whose readouts you tend to ignore unless you have reason not to. Mounted above are the all-important bank of change-up lights. The 4.4-litre V8 gives better than 515bhp at 8300rpm, after which the entire bank turns bright red before you hit the 8600rpm limiter. similar. Not so. Although their lap times are often separated by mere tenths, those times are arrived at in dramatically different ways. Nor do their configurations give any clue to how they’ll behave. The Aston DBRS9 and the Mercedes SLS GT3 are both large-capacity, long-wheel-base machines with gearboxes slung between the rear wheels, but while the Aston is a very physical and quite dificult car to drive, the Mercedes is so easy and forgiving it doesn’t seem quite right for such a brutally fast racing car. lift the remarkably gentle and progressive clutch and ease out of the pit garage, trundle down the pitlane and onto the track beyond. There’s a huge amount of assistance in here which I’m not sure I like. Clearly you have to have all the electronic safety nets and the paddles because the car would be slower and less reliable without them, but if the rule makers banned them all and made the cars effectively analogue machines, that would tip the balance of performance back towards the driver. The cars would be better to watch because they’d slide more and they’d place a far higher premium on driver skill. If a long distance race is to become anything more than a drawn-out sprint, it must include other ingredients such as a driver’s ability to look after his tyres, transmissions and traction all by himself. Then again in a category full of wealthy amateurs, the appeal of a car that can make you look better than you are is clear to see. Besides I’m not complaining: I have the honour of driving the Ecurie Ecosse Z4 GT3 on the very first occasion it has run in public, and the thought of getting it wrong in the middle of an official test and media day in a car that must contest two entirely independent series this year really doesn’t bear thinking about. Happily for me the car is run by two-time British GT champions Barwell Motorsport, who’ve been kind enough to bake the slicks in tyre blankets before bolting them onto the car, so it’s ready to roll from the irst corner. I do a couple of laps to bed in some new discs, pit, have a quick chat to make sure I’m happy with everything (I am, very) and then head out on the Silverstone Grand Prix circuit to find out more. It’s always the performance you notice first, because that’s the easy bit. Any old fool can plant their foot on the loor and, with clutchless flat shifts, just tug the right-hand lever every time the dash turns red. I was expecting a maniac, but in fact the Z4 is extremely measured in how it delivers its punch. There’s no bang in the back, not even much of a sense of the car coming onto the cam. It just offers hard but hardly ferocious acceleration from almost any point in the rev range. Compared to an SLS GT3, which positively throws you up the road on a mighty wave of torque, it feels quite sedate – which, given that it’s giving away almost two whole litres of displacement to the big Benz, it probably is. Five years ago I raced one of Richard Lloyd’s GT3 Jaguar XKRs here and, overweight and underdeveloped though it was, it still felt fairly unhinged in a straight line. The BMW does not. But not only did this Z4 score that pole at Spa last year as well, others also won the Dubai 24 Hours outright plus a couple of rounds of the FIA GT3 Championship. It must be getting its lap time from somewhere. It doesn’t take long to figure where that might be. For a start its brakes are absolutely monstrous. I am 6ft 4in and reasonably robustly constructed yet my right leg did not possess the power to activate the ABS at the end of Hangar Straight. So no need to think about how hard to hit the pedal because you can stamp with all your might with complete impunity, at least until some of the downforce has gone. But that’s just the start of its talents. 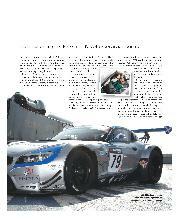 The only comparable car I’ve driven that gets into a corner like the Z4 is the GT3R Porsche. It flicks onto line like a mid-engined car and when you see how far back in the chassis the V8 lies, you’ll not wonder why this is. And the sheer corner speed it can generate is where it appears to have the greatest advantage. On some of Silverstone’s slower corners the nose will push frustratingly wide, though I later learn the tyres on the front of the car are well past their best. But through medium/fast corners such as Stowe, Club and the entire Becketts complex, it is simply mighty. In deference to those kind enough to put me in the car I kept it off the kerbs altogether, but it would still reel in everything it came across. On a fresh set of slicks it must be simply scintillating. Its final weapon is traction: not content with barrelling you into the corner at a speed few other GT3s appear able to muster, the BMW is just as keen to ensure you can get back on the power the instant or slightly before the instant the apex arrives. Just occasionally if you’re a bit too bright and early with the reapplication of power it will slide quite quickly, enough to remind you this is no recreational plaything. But you cannot have it all: if it’s front-running performance you want, it rarely comes complete with puppy-dog subservience. As ever, there is not enough time in the car, and a few laps later when it’s time to come in I’m still trying to understand how much down-force is available through Copse and the right hand lick at Abbey. Far more than I was using, that’s for sure. 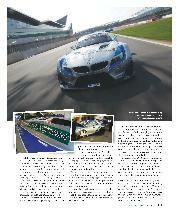 Driving the Z4 GT3 was more than just a fun few laps in a quick and capable car. It reaffirmed to me the fact that all those cars out there really are as different as they look, and that their talents lie in varied areas. But to the boys of Ecurie Ecosse all that will really matter is whether the Z4 GT3 will provide them with that stepping stone on the road to Le Mans. This season they will be charged with bringing it home as far towards the front of each race as possible, but bringing it home regardless. 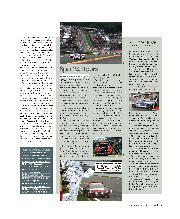 It has been lost on no one that the 2011 British GT Championship was won by a team that didn’t win a single race. That said, the campaign has started well, with a last-lap win at Oulton Park. If all goes to plan, 2013 will involve a step up to two cars and racing in both Europe and America. And if that all goes well, there’s an appointment with a track in France the following year. For the Scottish team with the French name, everywhere else is just a waypoint on the route. The final destination is never in doubt.